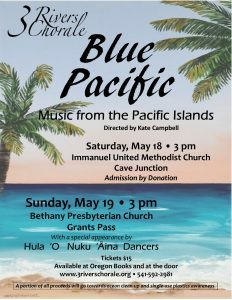 This May we are presenting music from all around the great Pacific Ocean….from the Philippines to Vancouver Island, plus Fiji, Tonga and the islands of Hawai’i. A portion of all proceeds will be donated towards ocean plastic clean-up and education. Human-created plastic waste now threatens all of ocean life — from whales and other sea mammals to fish of every kind and on down to the smallest ocean organism. We are dedicated to helping turn this trend around, and to find healthier alternatives to plastics on this, our one and only planet. Hawaiian choral music would not be complete without the songs of the great and last royal head of Hawai’i, Queen Liliuokalani. She was a prolific songwriter, poet, organist, singer and choir director who lived from 1838 to 1917 on the islands of her people. Lili’uokalani has been credited with reviving and advancing Hawaiian music and culture at a time when missionaries and white business interests were in the process of eradicating it. Her quest was to regain the sovereignty of Hawai’i for her people. Even when imprisoned (in 1895) by the powers who had taken control of the Islands, she continued to write songs, among them the famous “Farewell to Thee”, or “Aloha ‘Oe”. We are pleased to present to our audiences a unique version of this song, plus a few of Queen Lili’s lesser-known works, beautiful and loving musical poems that pay tribute to the flora, fauna, fragrances and people of her homeland. Other songs will hail from the rugged island-studded Canadian coast, Polynesia, and a work/play song from the island of Luzon in the Phillippines. 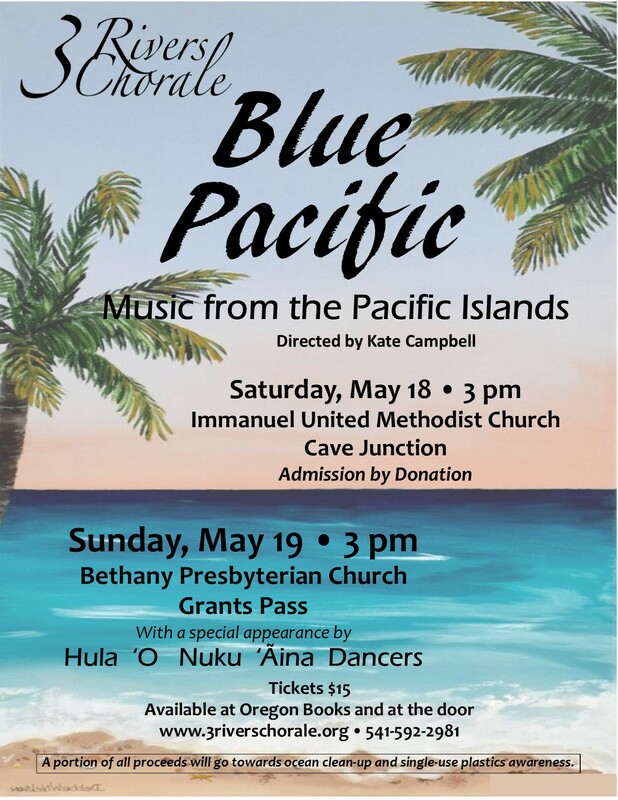 For the May 19 concert only (3 pm at Bethany Presbyterian Church at 741 NW 4th), we will be joined by the premier Hula dancers of Southern Oregon: Hula ‘O Nuku ‘Aina, led by Katherine Greene. They will display the ancient art of hula with both traditional and contemporary songs and poetry. Tickets for the Grants Pass concert may be purchased at the door or in advance at Oregon Books, at the corner of “E” and 7th in Grants Pass. Admission to the Cave Junction concert (May 18 at 3 pm) is by donation. This will take place at Immanuel United Methodist Church at 200 W. Watkins Street. We are pleased to collaborate with the musical duo of Tim Wallace and Michelle LeComte for this set of performances, as well as percussionist Gary Eby. The 3 Rivers Chorale is a membership supported community choir located in Grants Pass, Oregon. Kate Campbell is our music director. We are dedicated to bringing fine concert music to our audiences.